Is it the breastplate of righteousness? 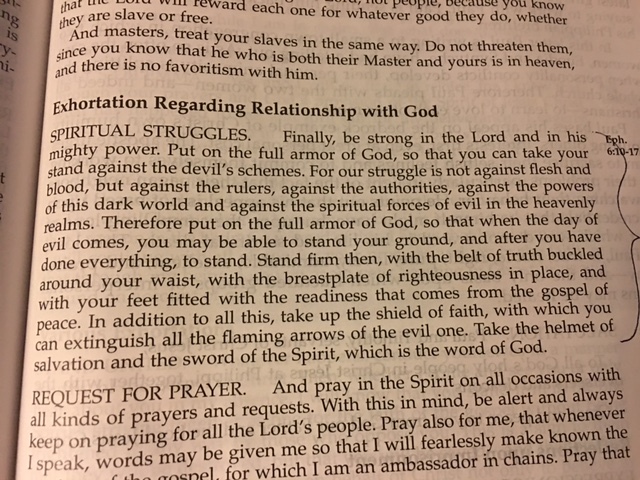 God tells us in Ephesians to prepare each day for the spiritual battles that are raging around us by putting on his full armor. Our struggles are not against the people and problems that we can see. It seems like it is. But God tells us that the battle is much bigger and much darker than what we can see. The evil schemes of Satan fill the spiritual world swirling around us. This makes a lot of sense to me. When I see the addictions and sinful, painful choices people make everyday that blow up their families and their lives, it’s clear that Satan is working very hard and he is winning some of the battles. My favorite piece of armor has always been the shield of faith. I can sometimes see the flaming arrows of the evil one coming at me. But my faith protects me. As I’ve been more committed to memorizing God’s word this last year, I am discovering a new understanding of the immense power the Sword of the Spirit has when we are well-prepared. When it’s etched on our minds and hearts, God’s word is powerful. It’s transforming. It is an extremely effective offensive weapon to use in pushing back the darkness. To shine the light of truth where sin has extinguished all hope. To get rid of the lies that confuse us. To help us get our eyes off of ourselves and focus on the One who has all the answers. And to remind us that God has already won the war. In him, we have victory. Today and everyday.